When it is time to pay tribute to someone whose life made a great impact on yours, this elegant basket is a a very good expression of peace, grace and admiration. It is made from roses, irises, alstroemeria and clematis which are perfectly finished with pittosporum and ruscus. Thank you for helping me express my sincere sympathy to a friend who lost a relative. She loved the funeral basket so much and even wondered whether I had made the choices myself. I was not sure I could pick the right funeral posies but placing the order here made the process very easy. At 10:45am the driver was at my door and delivered the basket. Flowers were very beautiful. I can give you a list of reasons why you should trust Handy Flowers in need of funeral flowers but the most important thing for me was having a company that will listen to my needs and prepare the tributes that I wanted. The team understood the pain that I was going through and arranged the flowers perfectly. Definitely give them a try. The basket arrived on time. The flowers were beautifully arranged. Reliable florist! 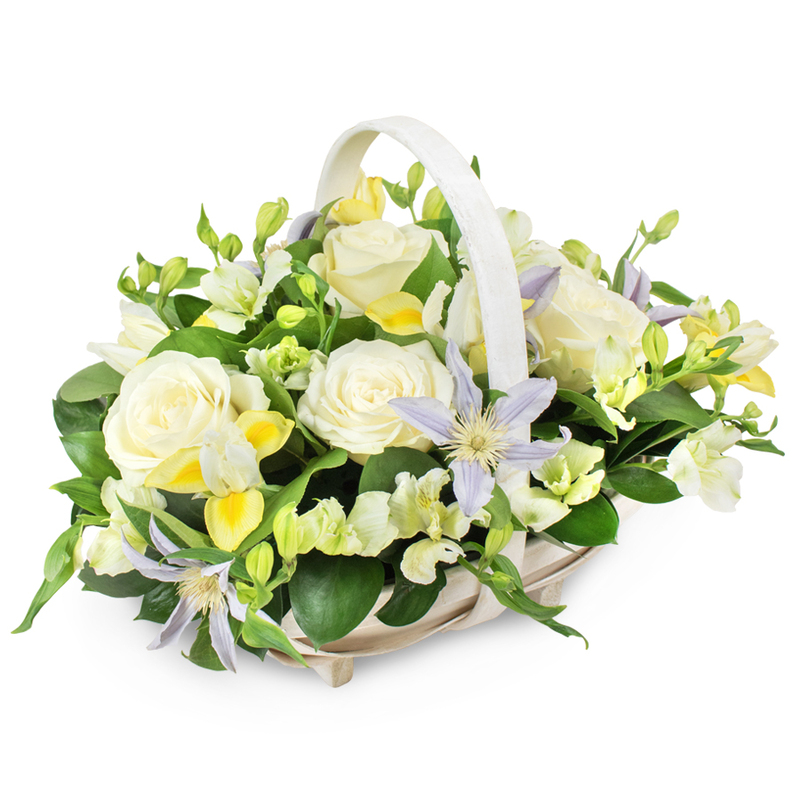 The family of the deceased insisted on having white flowers on the funeral and I decided to order this beautiful basket. It was very delicately arranged. Good work. I ordered flowers online for two separate funerals. The products and the service were excellent.